OriGen is announcing a change to the Percutaneous Introducer Products. The new PCT Kit (Part Code: PCT) is designed to minimize the cut-down on the jugular vein during cannulation and can reduce the need for post-ECMO wound treatment. The PCT Kit includes sharps, guidewires and dilators. 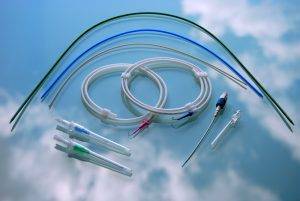 The PCT Kit can be used with any size OriGen Catheter including VV13F, VV16F, VV19F, VV23F, VV28F and VV32F. The PCTa Kit (Part Code: PCTa) has been discontinued by OriGen when the remaining stock is completely sold out. OriGen is estimating that the PCTa Kits will no longer be available soon. Catheters are purchased separately from the PCT Kit. Please note, the additional components, such as the dilators, in the PCT Kit are included to aid in the modified Seldinger Technique. The dilators are not present in the PCTa Kit. Each catheter is packaged with two introducers: a blunt introducer for use in surgical insertion and an over-the-wire introducer for use in percutaneous placement. For more information on the PCT Kit or any other OriGen product, please contact us at 512-474-7278, through email at sales.us@origen.com, or by completing the contact us form.